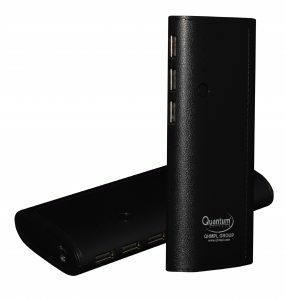 Yet, another extension to its successful Power Bank portfolio, QHMPL, a leading frontrunner of consumer electronics and IT peripherals, announced the launch of its portable and durable QHM‘10000mAh Power Bank’ equipped with 3 USB Ports, bringing elegance paired with functionality. The high capacity 10000mAh, sports a sturdy and durable finish. The Power Bank comes with 3 USB power outputs that lets you charge max devices at one go. Integrated with LED Indicator, the power bank keeps your battery status in check. A BIS certified product, the power Bank is fortified with several safety features such as over voltage protection, short circuit, over discharge and over current protection. The high-powered Lithium-ion battery ensures faster charging, with 10W output. It offers a maximum output of 5V-2AMPS, a conversion rate of up to 80 percent and adjusts the output as per the connected device. The device supports over 500 times of charge/discharge cycles. The Powerbank is now available in shades of White and black, with the leading retail and online portals across India.